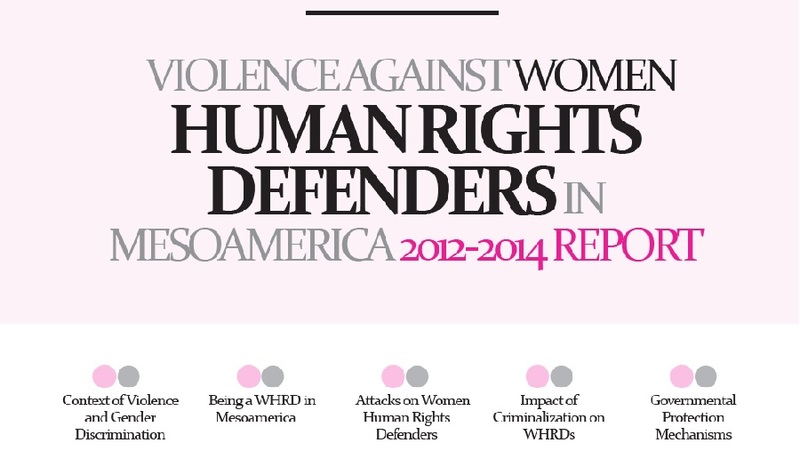 The 2012-2014 report on attacks against women human rights defenders in Mesoamerica is the result of a collective effort by various people, organizations, national networks and initiatives that make up the Mesoamerican Initiative of Women Human Rights Defenders. First of all, we want to thank all of the women human rights defenders who allowed us to document their attacks. Their support is the fundamental basis of this report and is our main motivation in our work to end violence and discrimination against women who day after day contribute to the advancement of women human rights defenders in Mesoamerica. The information presented in this report was collected thanks to those responsible for collection and verification of the attacks and for completing the database: Atziri Ávila and María Martin from the National Network of WHRDs of Mexico and Emilie De Wolf from Consorcio Oaxaca; Lucidalia Mercado, Evelyn Cuéllar, Katherin Cruz Cerrato, Lorena Zelaya, Yessica Trinidad and Karla Lara from the National Network of WHRDs of Honduras; Santa Marxeli Argueta, Gladis Chinchilla and Alejandra Burgos from the Salvadorian Network of WHRDs and the Colectiva Feminista; Gilda Lemus, Angela Fuentes and Teresa Mendoza from UDEFEGUA; Nicaraguan WHRDs Initiative and Valentín Ermita (AWID). In order to improve the quality and reliability of the information, an important contribution was the internal audit of the IM-Defensoras Registry of Attacks conducted in April 2015 by UDEFEGUA and AWID. Monitoring and support for the entire process of preparing the report was conducted by the Coordination team (JASS and Colectiva Feminista) and the Executive Secretary of IMDefensoras (Axela Romero). Finally we thank all the donors that provided resources making publication of this work possible.